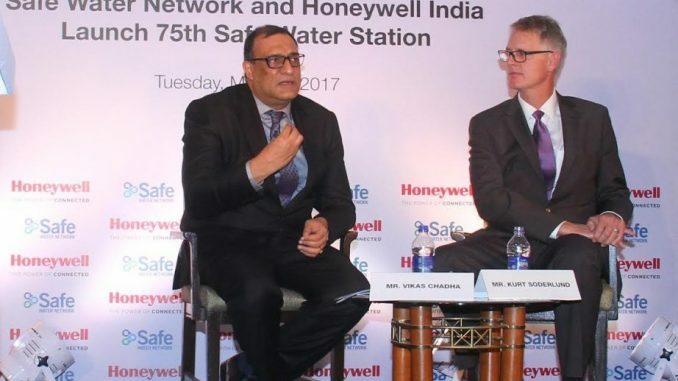 Hyderabad : Safe Water Network and Honeywell India today launched their 75th ‘safe water station’ to provide safe water access to people in Telangana districts affected by groundwater contamination, including fluoride. The “locally-owned and locally-operated” safe water stations deploy a six-step treatment process, including reverse osmosis and ultraviolet to purify water, Safe Water Network said in a release. “We are committed to ensure that communities have access to safe water, especially the poor,” the release quoted Kurt Soderlund, CEO, Safe Water Network, as saying. Over the last two years, Safe Water Network and Honeywell India have set up “safe water stations” across Karimnagar, Adilabad, Warangal Rural, Warangal Urban, Jayashankar, Mahabubabad, Jagtiyal, Peddapalli, Badradri, Mancherial, Suryapet, Khammam, Medak, and Nalgonda districts, it added.